As an iGalen Team Member, you proudly represent iGalen’s innovative products. 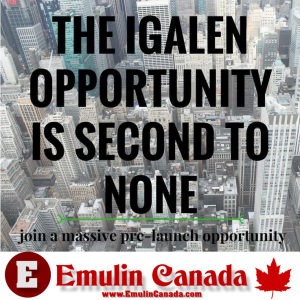 We believe the iGalen opportunity is second to none for those that want to earn a serious part-time income or make a full-time career out of it. At iGalen we are fusing innovation and opportunity into a movement, a movement that will lead people to greater health, sustainable wealth and life long happiness. We’re revolutionizing human consumption of carbs and moving past the status quo. We believe it takes more than phenomenal products in order to create a unique opportunity; it takes synergy. It’s a collection of just the right pieces, when united they create something significantly greater than just the sum of the parts. iGalen is a fused synergy blended with amazing products, brilliant compensation and talented leadership creating the future. Your future! At iGalen we didn’t reinvent the compensation plan, rather we transformed it. It is rewarding, engaging and sustainable. The iGalen environment empowers you to think beyond the “paycheck to paycheck” mentality, by enabling you to envision living a life rich with abundance.